For those who are new to the Stamp Review Crew, here is a little background. We are an international group of Stampin' Up! demonstrators that gets together on the first and third Mondays of every month to do a blog hop. 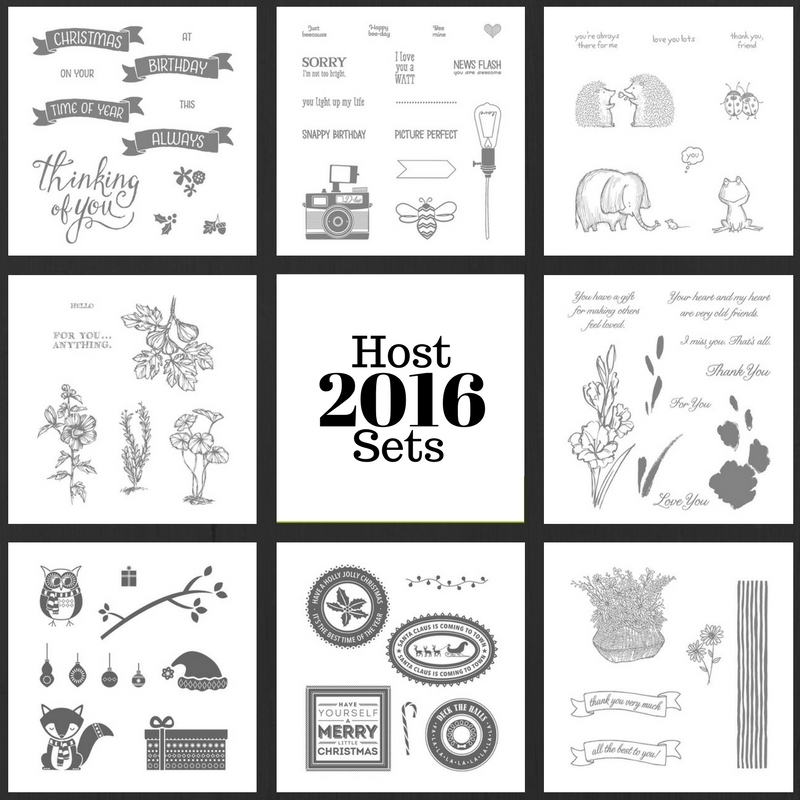 Each hop features a single stamp set to give you loads of inspiration for that set! Except this time :) This time we are featuring the Host Sets, which often get forgotten. The hops are archived at the Stamp Review Crew blog, and you will be able to click through each hop at any time, going directly to the posts for that hop whenever you want! And you can click on the banner of this post to go to the master blog roll for this hop also. If you are following along in order, you just arrived from Rochelle Blok's blog, and she always has such beautiful projects! 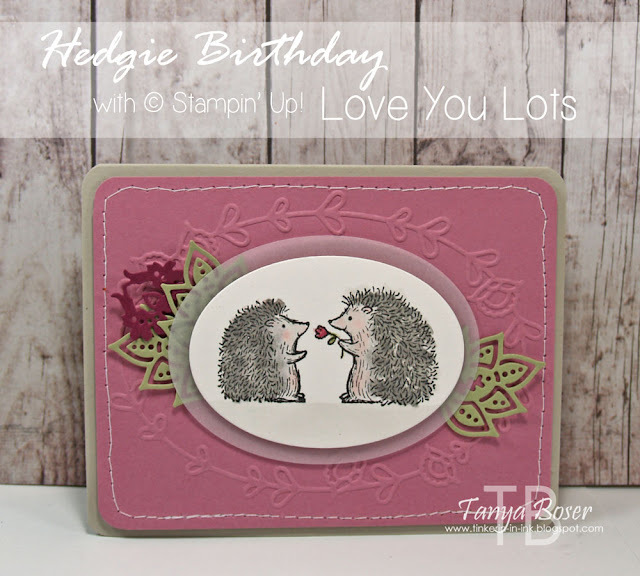 Prepare a Sahara Sand 4¼"x5½" card base, round the corners with the Corner Rounder punch. Cut a piece of Sweet Sugarplum to 4"x5¼", round those corners too. Center the Sweet Sugarplum panel in the Pretty Paisley embossing folder and emboss with the Big Shot. Optional: stitch around the edge, or draw a line with a white gel pen. Stamp the hedgehogs on a scrap of watercolor paper in Archival Black ink, watercolor with Smoky Slate and Blushing Bride for the hedgehogs, and Sweet Sugarplum and Pear Pizzazz for the flower. Ground them with very dilute Smoky Slate. Add Clear Wink of Stella over the hedgie spikes and the flower. 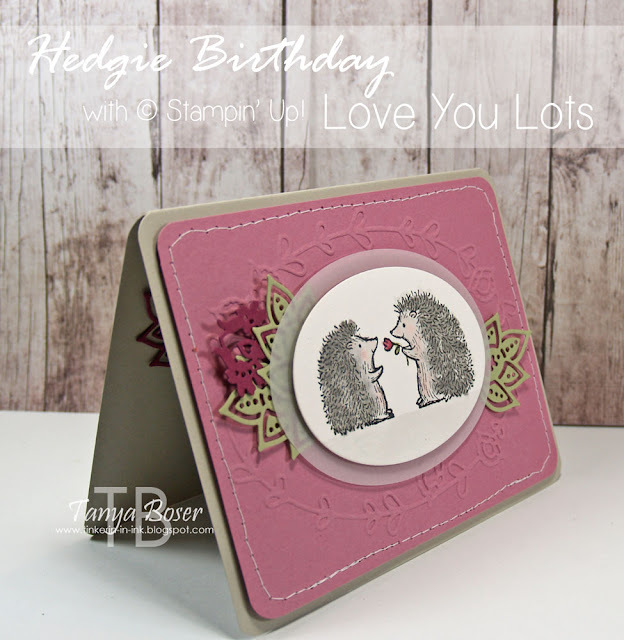 Die cut the hedgehogs with an oval die, then die cut a larger oval in Vellum. Layer the ovals together using dimensionals. Then apply dimensionals behind the Vellum layer. Adhere the focal ovals to the Sweet Sugarplum panel. Put more dimensionals, or use cut down coasters, on the back of the Sweet Sugarplum panel, and adhere to the card base. 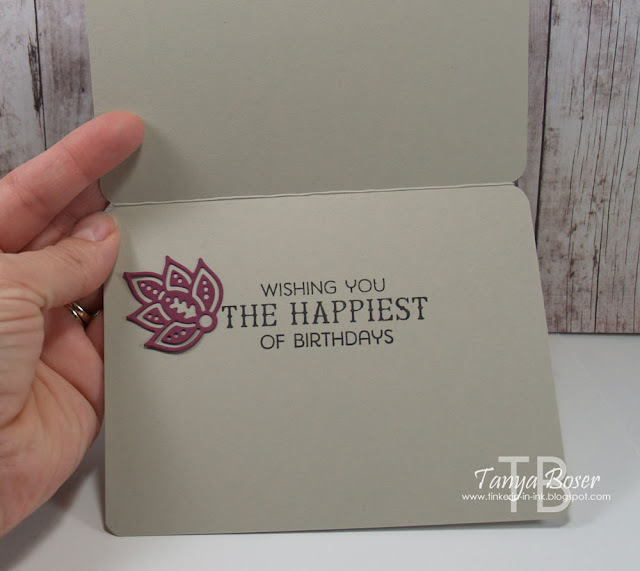 On the inside of the card, stamp the sentiment from Birthday Fiesta in Archival Black ink, then use the Fine-Tip glue to adhere the Rich Razzleberry fancy leaf next to the sentiment. I am really surprised that the sentiment in Birthday Fiesta goes so well with both the hedgies and the Paisleys Suite. How about you, what do you think? We also have a Pinterest board for every hop, check it out! Are you ready to head over to the next stop? Shana Gaff will have lots of wonderful inspiration for you!